Heather McNaugher teaches poetry, nonfiction, and literature at her alma mater, Chatham University, and is poetry editor of The Fourth River. McNaugher's work has appeared in 5 A.M., The Bellevue Literary Review, New Ohio Review, The Gay & Lesbian Review, Leveler, and The Cortland Review, and on the radio show, Prosody. Her chapbook, Panic & Joy, was published by Finishing Line Press in 2008. She was a 2011 finalist for the Gertrude Press Chapbook Contest (for her manuscript, Emergency Contact), a finalist for the Robin Becker Chapbook Prize sponsored by Seven Kitchens Press (for her manuscript, The Answer is a Shudder), and the Irene Heinz Given Professor for 2010-2013. Her poem, "I Could Never," included in Panic & Joy, received an Honorable Mention for the 2006 Allen Ginsberg Poetry Contest. Additionally, she received an SUNY Summer Incentive Research Fellowship in 2002. McNaugher has worked as a house cleaner and barista in Seattle; as a dog walker in Brooklyn; and then earned her PhD in English from The State University of New York at Binghamton. While working for the Carnegie Library of Pittsburgh, she almost became a librarian (and was a 2009 Fetzer Institute/American Library Associate Scholar). She's tried living elsewhere, but keeps coming back to Pittsburgh. Blast Furnace recently spoke with the poet professor, over a couple of fine cups of joe at a local Pittsburgh cafe, about what it means to see her first full-length collection of poetry in print by Main Street Rag and the process and path to getting there. Have any of the poems in your first full-length collection of poetry, System of Hideouts, been in your previous chapbooks? No other publications [other than the journals listed on the book’s acknowledgments page]; for my first book I felt strongly that they should be all new poems. I had such support in 2008 when I put out Panic & Joy, and I knew I’d be relying on these same people to support the next book; I couldn’t have half of it be poems they’d already read. What does the book's title say about the manuscript? It’s taken from a quote from Rabbi Martin Buber's The Way of Man: “To escape responsibility for his life, he turns existence into a system of hideouts.” It’s about resisting your calling; finding every other way to not do what you’re supposed to. It’s about resistance and solitude…about being a grown-up and finding it rather stunning. How long was the manuscript a work-in-progress for you? Three years. About two-thirds of the poems came very quickly. About two, two-and-a-half [of those three] years [was] going back and revising. On that note, do you have a trusted resource or group of reviewers who give you feedback on your manuscript? I write in a total vacuum; nobody sees [the manuscript poems] unless I’m sending it out or [hears them] unless I’m reading aloud [at a public reading], and then I pay the price. It’s fear-based, and it’s about laziness; I don’t want to have to do the work anyone suggests! With Panic & Joy, I finally sent [the manuscript] to Mike Simms [Founder and Editor-in-Chief of Autumn House Press, Pittsburgh] and got the green light to submit it. Three contests later and I had a publisher. But that was after two years and hundreds of dollars in postage and reading fees, sending manuscripts out into the ether. I could spare myself a lot of tedium and agony if I’d ask for help sooner. Did you write the poems as individual entities to send out, or with the anticipated outcome being a book early on during your writing process? I knew I was writing a book, with the external pressure of motivation and needing to answer to my students by being a professional writer; for example, revisiting traditional forms and writing in traditional forms in order to teach [the forms]. If you’re writing more organically than formally, the forms present themselves in a happily authentic way, with cadence and internal rhyme presenting themselves in such a way that I’m honoring the sounds of poets who came before me. I’m not a good appraiser of my own formal work, though I can tell others when their poetry is good and why. Friends of mind in the late 1980s, Erika and Camille, from Fox Chapel High School. They put together a literary magazine, called ‘Tapestry.’ It’s still around, I think. Reading novels. Daily Life. Things like, if I lose my keys, or working at [a grocery store], or knowing how to shop for myself at thirty-six. [My poems] are almost entirely autobiographical. If a thought stays with me long enough, like there’s a poem that’s been rolling around in my head about a time in my twenties when I was pretending to be a vegan or vegetarian and I burst into tears when I ordered a veggie burger and got the real thing instead, but couldn’t send it back to keep up the farce in front of the beautiful vegan red-head I was dating! It has to linger. It’s 17 years later and I have to write it down. It has to have hilarious potential. It’s a gift to make people not feel alone and laugh. If I have done that, that’s enough. One poem like that is “Denver to Tulsa” [not in the manuscript], which is a poem about an experience the writer is a little ashamed of. I’m now willing to do that, and the poems I like are unflinchingly willing to expose, not in a voyeuristic way, something the poet was ashamed of and is now willing to put out there. Talk about the territory you were in when you started—and during—writing of System of Hideouts. It was pretty much my first time single in my adult life. It was…necessary, the first time in a while where I was living alone. A lot of these poems were in that space, waking up morning after morning alone. Which I love, but noticeably distinct from my previous lives, where the refrigerator and bed were in the same room, and at thirty-five finally buying a car. A lot of the poems became driving-around poems. It was a time of staying really still, settling. I live in Pittsburgh. I live in this house for the foreseeable future and I don’t have to make any major changes—life rolls along and does that for us. Stillness for the first time—uncomfortable as it may be, but necessary, and if that stillness becomes stasis, will I notice when it becomes stagnation? When will the uncomfortable become comfortable? What did you learn while writing the manuscript? That I could take care of myself, that I love and need my space to be pretty much exactly the way I want it to be. That I really like a good series on DVD: hours and hours of mindless entertainment is a return to being an only child—but this time on my terms, in a fun, rather than neglected and lonely, way. I believe in the book. I think Main Street Rag [and M. Scott Douglass, Editor/Publisher] has a good eye for voices like mine—writers who are willing to explore the mundane and make it quirky and fun. What is your hope for the manuscript? That I get to keep my job; there are very practical stakes—it’s not all chain-smoking in an attic, waiting for the muse to strike—, and that people shake hands with that part of themselves that usually goes unacknowledged. 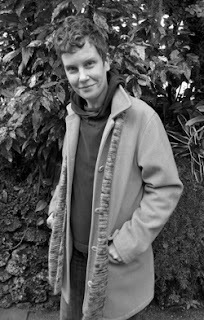 Editor's Note: Part 2 of Blast Furnace's interview with McNaugher will be posted to this site in April, along with some of her poetry.